Unpredictable weather, extremely steep hills, and a wide variety of soil formations in our vineyards are both a challenge and a gift. They require that we stay focused and that we keep evolving, on the business and on personal levels. Each of our vineyards, down to each single cask, deserves our specific attention. We give our best to produce the optimal wine for each vintage, all while using a sustainable approach, working by hand to guarantee outstanding quality, crossing borders, and assuming responsibility toward our employees. The local conditions in our vineyards, i.e. their aspects, soil formations, and micro climates are all decisive in choosing the right varieties to plant. Südsteiermark is known for cultivating a wide range of grape varietals, owing to its outstanding diversity of vineyard sites. The rolling wine lands of Südsteiermark go back some millions of years: when the primal ocean was retreating, winds and rivers left compacted limey marl behind, volcanic rock, and the sands of former riverbeds. The location of these soils determines the best varieties for planting and also on the quality of the wines. It is thus no surprise that two wines of the same variety, when different in local origin, clearly differ in structure and taste. This means you can taste this local origin in the wines! And the smaller the patch of earth where the grapes for a certain wine come from, the more clearly it will reveal its origin to the taster. This is particularly true for our single-vineyard wines (or crus). The grapevines on these sites are few, and the unmistakeable traits of their origin are recognisable across the vintages. Our village wines (or Ortsweine), in turn, exclusively come from our vineyards in defined wine-growing villages, such as Ratsch or Gamlitz. Each of those wines has its own distinctive features. Last but not least, our regional wines are grown all across Südsteiermark, reflecting the style of our wine-growing region. The symbol for these three wine lines is the pyramid of origin as is used in many wine-growing regions of the world. It clearly illustrates three levels, in both quality and quantity: regional wines, village wines, and single-vineyard wines. Single-vineyard wines originate from a clearly defined vineyard site with excellent soil and a highly favourable micro climate. All STK wineries, including our own, have defined a strict catalogue of criteria for these wines, including for how long they should be left to mature in the cellar. 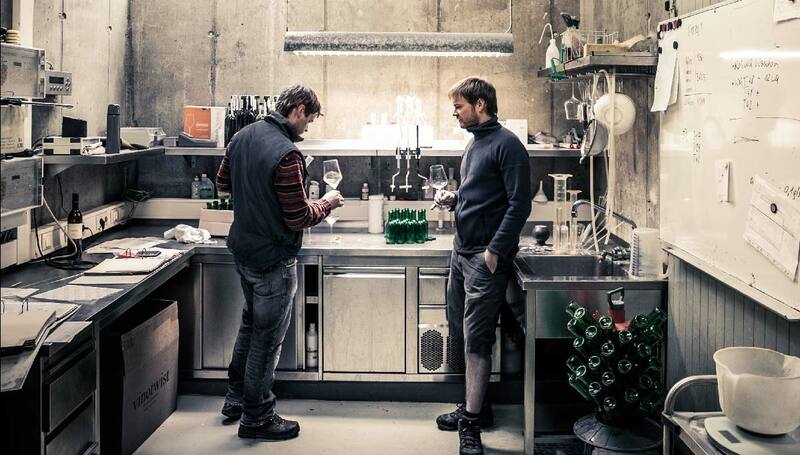 Wines of the Große STK Ried category are left to mature for 18 months at least before they leave the winery. In addition, the grapevines must have reached a minimum average age of 15 years and allow for an ageing potential of 10 years or more. Erste STK Ried wines are available from 1st May of the year following harvest. The minimum average age of the grapevines is twelve years, and the potential for ageing of the wines is five years or more. The Ried Nussberg has always deserved our special attention. It is the home ground of our winery and at the heart of our work and life. Other renowned vineyard sites (or Ried) of Weingut Gross are: Sulz, Perz, Witscheiner Herrenberg and Kittenberg. They tell us all about origin, about the terroir of the small sites where they were grown. They have enormous potential for ageing but are available in comparably small quantities only. In our range, “village” wines (or Ortsweine) form the golden mean between Südsteiermark regional wines and single-vineyard wines. They are equally attractive for lovers of highly individual single-vineyard wines and friends of the “Steirische Klassik” regional line. Our approach to the “village” line matches our philosophy concerning single-vineyard wines: the ambition is to make the conditions in our vineyards detectable on the palate. Whether the sandy soils of our Gamlitz sites or the chalk-bearing soils in the bowl-shaped sites of Ratsch: the terroir makes the taste. Unlike our single-vineyard wines, our “village” line makes it possible to vinify grapes from various sites in one and the same village. We use the same attention and care to mature them as for our single-vineyard wines. Our “village” wines from Gamlitz and Ratsch are left to mature for at least eight months before we bring them to the market. They have a high potential for ageing and are outstanding companions for your meals, at an affordable price. 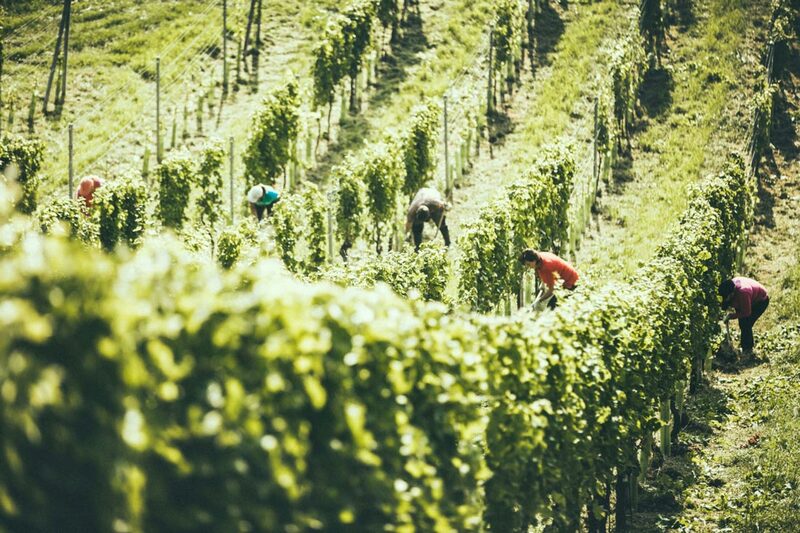 The baseline of our range are Südsteiermark regional wines: they are exclusively grown on our own sites in the region. These wines originate from different vineyards and reflect the diversity of South Styrian wine. The label of Jakobi depicts an ancient farmer’s calendar and provides information about the vintage in which it was made. Symbols for full moon, hail, or time of harvest tell you all about the wine and significant events that happened during the year. Our “Steirische Klassik” line includes five region-specific varieties: Gelber Muskateller, Sämling, Sauvignon Blanc, Pinot Blanc, and Welschriesling. These wines are best enjoyed in their first years and stand for light-hearted freshness and plenty of fascinating aroma – a typical feature of Styrian wine. A significant portion of our vines is rooted in Slovenian soil. Further to the South in Štajerska Slovenija, near Ptuj, is the wine-growing village of Gorca. Steeply sloping terraced vineyards form a wild and romantic landscape with winding roads and breath-taking views behind every corner. Starting in 2007, we enlarged our sites and reactivated a former vintner’s house and cellar. In our minds, Gorca is among the most charming wine-growing regions in the world, not only because of its hidden beauty. Together with local producers, it is our ambition to bring new life to Štajerska Slovenija and perhaps even restore its ancient fame. Read more about our wines and activities in Štajerska Slovenija. Austria’s Sunny Southeast and Slovenia are both marked by Alpine and Mediterranean influences, the so-called Illyrian climate: it provides us with sufficient rain during the summer months and with extreme temperature variations. A diurnal variation of up to 20°C is ideal in order for aromas to build up in the wines. On the other hand, the bracing climate does not spare us from extreme conditions such as spring frost during budbreak, heat waves, or hailstorms shortly before harvest time. Our vineyards are located at altitudes between 300 and 500 meters asl on sites with varying soils. The spectrum ranges from what is locally called Opok (a limey marl), to Leithakalk, on to sands and gravel, schists, and soils of volcanic origin. Both the soil formation and aspect of a vineyard are crucial in planting a new vineyard site. This location diversity is mirrored in the wide range of varieties cultivated in the area. Slopes of up 38 degrees put a strict limit to the use of machinery in the vineyards. Manual work is key to achieving the best quality possible in any vintage. This begins with the labouring of soils with a hatch, and ends with manual grape picking. We strongly believe that the grapevines should be tended in full harmony with nature. From its early days onwards, each freshly planted scion needs sustainable care and attention in order to grow into a solid, deeply rooted grapevine. We therefore avoid the use of herbicides (chemicals to destroy unwanted vegetation), insecticides (chemicals to destroy unwanted insects) or botryticides although we do take steps against aggressive fungal diseases that can thrive in a humid summer climate. We use our home-made compost as fertilizer and wood chips from our forests, and we have our own organic sewage plant for waste water from our cellar, among other sustainable processes. This is at least how far our family will go to produce a wine “made by Gross”. While climate and soils in a certain terrain are responsible for the temper of a wine, it is our task to interpret its origin in the cellar. To carve out the characteristics of a specific origin, each vineyard block is vinified individually in our cellar. One year, it may be the 300 litre oak cask that is needed for a certain wine, but the next year it may be the big wooden cask or the steel tank – there is no room for dogmas in our work. This is why we prefer not to focus on the use of certain techniques in our philosophy, or on their omission (such as crushed must fermentation, maturing in barriques, no sulphur etc.). We give each cask the specific attention it needs for its contents to mature ideally. Wines made by Gross are all-natural products, with a cultural foundation. We let nature have its way, working with it rather than against it. Our way of life, and work, reflects the vagaries of nature, good or bad. Work in the cellar, lastly, will reveal the influence of nature, and our way of handling cultivation and harvest. Trying to improve on nature or making wine using industrial processes is not compatible with our principles. We often compare the schooling of our wines with the raising of children: what does a wine need to fully develop its talents, what can we expect without “asking too much”?